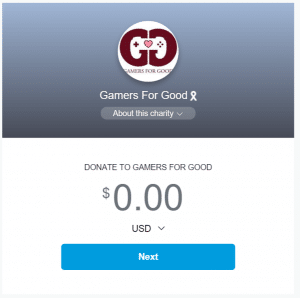 Are you wondering how you can support Gamers for Good's efforts? A quick and easy way to send Gamers for Good a donation through Paypal. 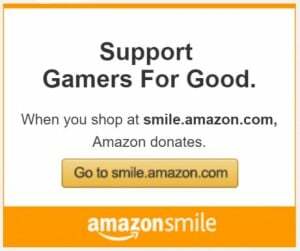 Quickly tell Amazon to share portion of your sale price with Gamers for Good. Did you know you can choose what charity benefits from most of your Humble Bundle purchases? Did you know you can add a donation to your choice of charity to any eBay purchase? Did you know you can support your choice of non-profit through sales you list on eBay?